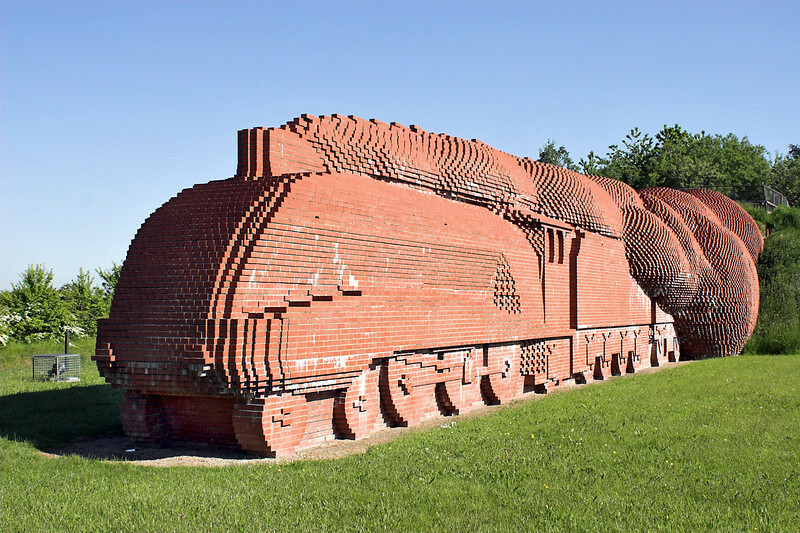 Hello and welcome to edition 45 of the Railwaymedia blog. As I guessed at the end of my last blog posting, the lovely weather we had been enjoying during the first week or so of June didn't last long enough for my day out the following week﻿. I decided on a trip to Oxford and Kings Sutton, principally for the class 56 hauled trial fly-ash train from Calvert to Didcot Power Station, but also for the Chiltern loco-hauled evening services. The first of these aims didn't quite work out as planned. 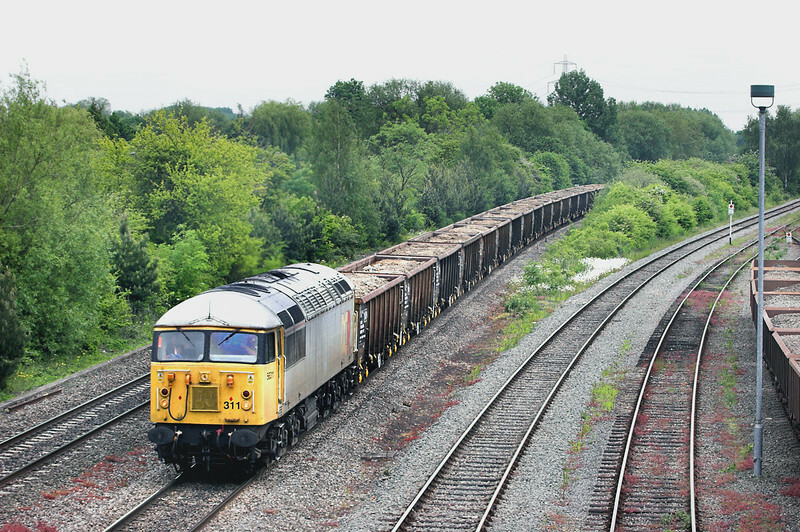 With the fly-ash train booked to finish at the end of that week I planned visiting a few Oxfordshire Wetherspoons before making my way to the footbridge south of Oxford at Hinksey Yard to photograph it. Checking up on the way there Real Time Trains was showing the train as cancelled so, with it being somewhat cold (I hadn't taken a coat thinking it would be warm down south! ), I was sat in the pub when I realised 3 minutes before it was due that it was now running again. Despite a bit of a jog down the road all I could managed was a glimpse of 56091 from the distance as it crossed the bridge by Oxford station. Trying to salvage something however, I did later get myself to Hinksey and was rewarded by the fact I learnt two more class 56's were expected! One was a Colas working with 56105 heading south from Crewe to West Ealing dragging a couple of Network Rail vehicles, the second was another working to Calvert, this one from Thorney Mill hauled by 56311. It was touch and go if we would actually get to photograph them passing each other but in the end they were 3 minutes apart. With at least 9 class 56s currently being used on the mainline (Colas Rail using 56087, 56094, 56105, 56302 and DCR using 56091, 56301, 56303, 56311, 56312), 2013 has seen a remarkable change in fortune for the class. Maybe some operator will start using class 58s? Wishful thinking. The evening was finished off at Kings Sutton and Banbury to photograph the Chiltern workings. 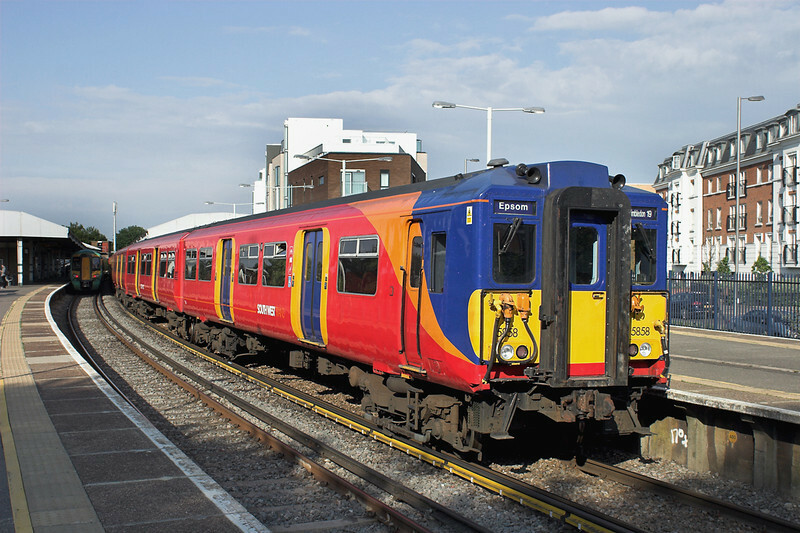 There are four loco hauled trains out of London Marylebone at the moment on weekday evenings, the 1647 to Birmingham, 1715 and 1815 to Kidderminster and 1750 to Banbury. I travelled from Banbury to Birmingham on the 1815 and what a pleasure it is to be on these refurbished Mk3 coaches with a tasteful and smart grey interior. An hourly all day service with these would be nice. 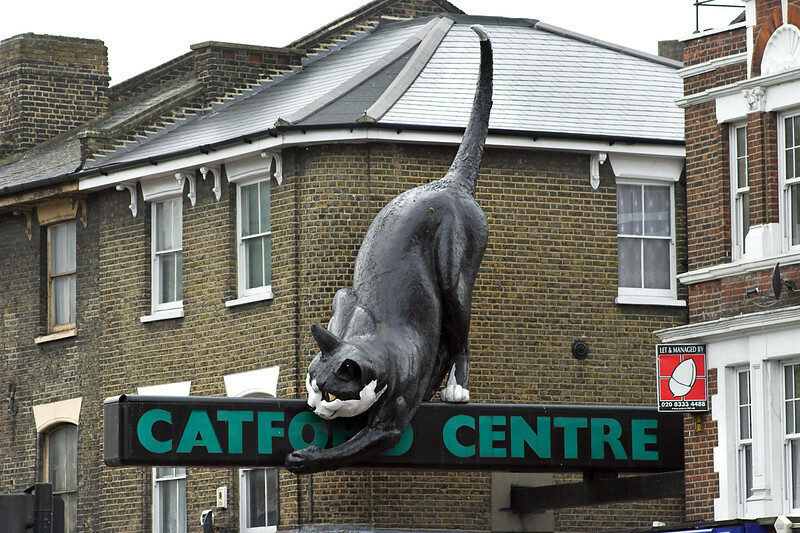 My other two main trips out this month have been both to South London, with varied results; both I again based around visiting Wetherspoons pubs I had yet to visit. To some extent because there are so many in the London area you can, with the help of a bus/tube/train map, just follow your nose and from one pub go to the next nearest one and so on. I started off going to the one nearest Canary Wharf in the Docklands, with the added aim of getting a few extra DLR pictures. 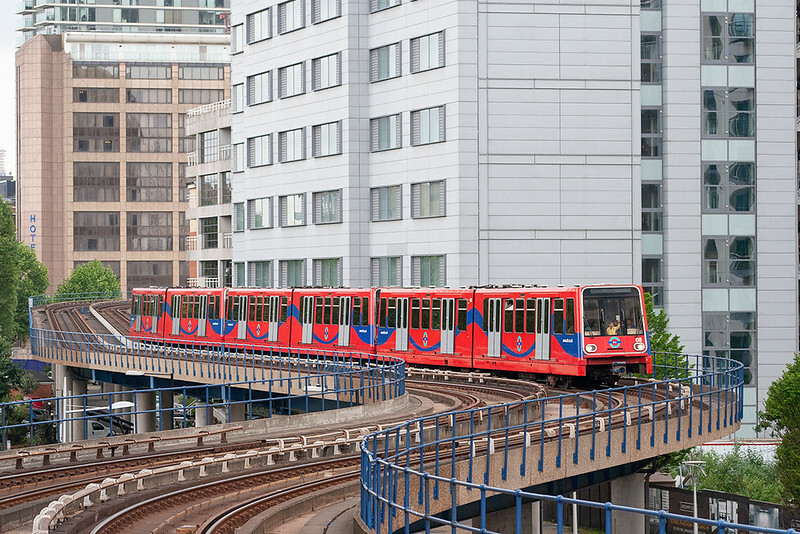 My other aim of the day was to end up in the Croydon area to photograph the tramway which I had not covered since June 2007. Since my last visit there has been a small batch of Variobahn trams delivered to increase service frequencies, and all the older Flexity trams have been reliveried from their previous quite nice livery based on the old London Tram red and cream to a much more lurid turquoise, white and blue effort. The weather cleared up nicely in the afternoon so I spent an hour or so photographing the most scenic section of the line, that through the South Norwood Country Park near the Arena stop where the branches to Elmers End and Beckenham Junction diverge. 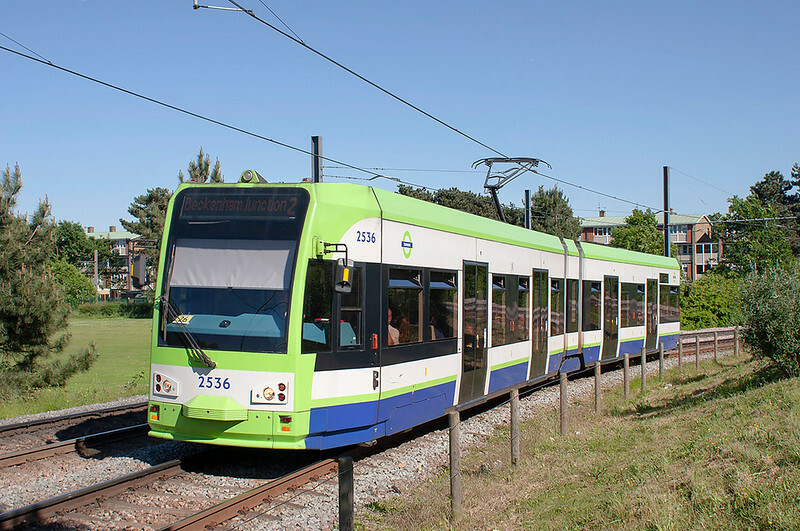 Aside from the now obsolete original livery I hadn't realised the other 'nod' to the original London Tram system is that the numbering system for the Croydon Trams commenced at the rather odd number of 2530 because the highest numbered original tram was numbered 2529. A week later and I headed back to London. The intention was to return to South East London and cover both the Wetherspoons and the trains in the area east of Woolwich and Lewisham, but on the train down from Preston I realised that Royal Ascot was taking place that weekend. In past years I have gone down to Egham to photograph the several special trains that run for racegoers, so thought that would be a better idea for the day. The empty stock workings I had seen on the internet turned out though to be just the returning units from the augmented London to Reading service. Thinking about those pictures of DMSs spurred me on to finishing the processing of a few scanned pictures that have been on my computer for some time awaiting uploading to the website. Having cleared those I intend over the next two weeks to resume scanning my collection of 6x4 prints, assuming the weather doesn't perk up allowing me to get out with my camera. 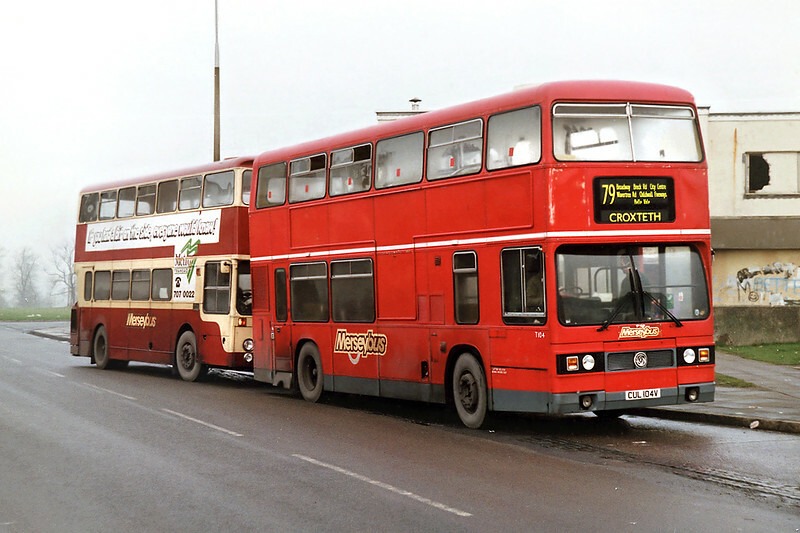 For now I will recommence scanning in my bus pictures as I am currently about half way through these. The latest batch I finished off this week included shots like this one from Liverpool taken in 1993 depicting a former London Transport Leyland Titan drafted into service with Merseybus. ﻿A warm (literally) welcome to another Railwaymedia Blog, number 44, written from my old laptop whilst sat sweating in the garden, and covering where I've been out photographing in the last few weeks, or more precisely the last 6 days, whilst the British weather has taken a summerish turn. The first week or so after returning from Bulgaria (as documented in the last Blog) was taken up with work, though I did manage to scan in a few shots from between 1998 and 2001. The late 90's wasn't a particularly productive time for me photographically, indeed I only managed to rescue 22 pictures from the those 3 years. The later pictures I have recently scanned I still had the negatives for, but for all the rest going back I am having to work from the 6x4" prints. These first few I have processed have come out reasonably well and they can be seen for the next few weeks in their own Gallery. 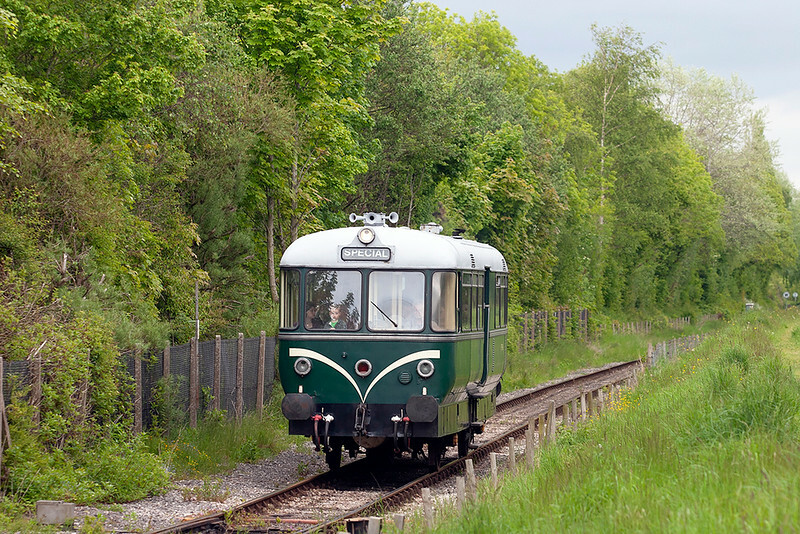 Back to more recent photography and a recent picture on I came across on the internet drew my attention to the fact that my local line, the Ribble Steam Railway, currently has one of the 1958-built Waggon & Maschinenbau railbuses, E79960, on long term loan from the North Norfolk Railway and it is being used on Wednesdays during school holidays. Half-term week I had to therefore nip down and get a few pictures, although the promised sun didn't appear. Next time it is out I will certainly go for a ride on the unit as the sound of it clanking onto the dock swing bridge was superb! As is often the case, the week the kids go back to school is often warm and sunny and, as any British readers will attest, this week has unusually been both. It has fortuitously also for me coincided with an easy week at work which has enabled me to get out with my camera every day. I did have to do some work on the Sunday night so on Monday it was just a case of a few hours in the afternoon, the main target being the Colas Rail log train which appears to be now booked for class 56 haulage. With a pool of four of the ex-BR engines (numbers 087, 094, 105 and 302) currently in service the class 66's have been deployed elsewhere. 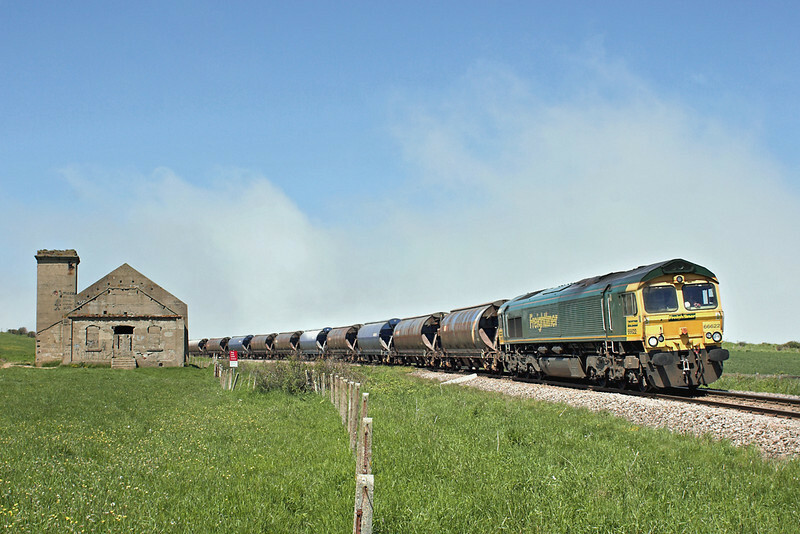 The use of 56's has also seen the return of the log train to the West Coast Main Line via Shap rather than via Settle. 56302 was used until the 3rd June with 56087 taking over for the remainder of the last week. A different class of loco at the front now means that I can revisit all the locations that I have previously photographed the train and get more pictures! Tuesday was the longest trip of the week. My car, normally used to just pottering 2 miles to and from work, doesn't know what's hit it this week! With train travel for me fairly cheap and petrol obviously expensive, I tend to go about by public transport, but sharing the cost with a friend makes it worthwhile so a good forecast meant we headed over to Teeside, an area I have not covered for ages. I have done shots at South Bank near Middlesborough in 2003 and 2004. 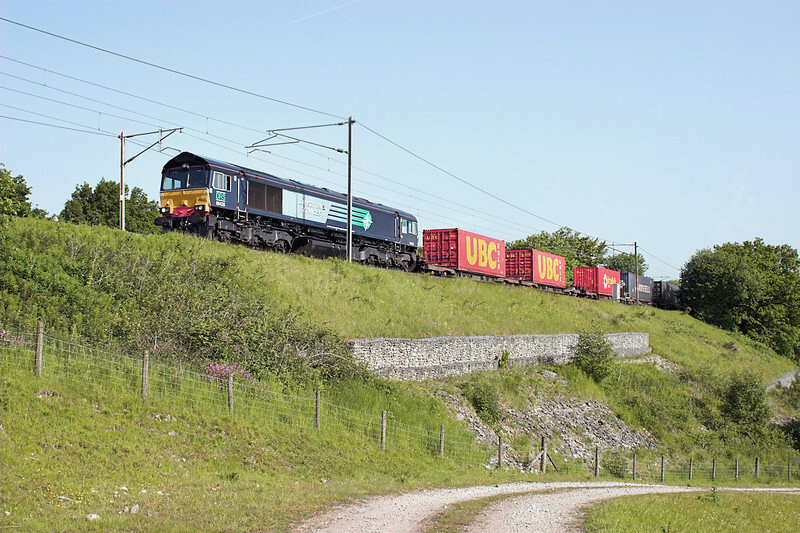 I had also set out on a trip to the freight only Boulby line that year but my Daewoo suffered a Head Gasket failure at Kirkby Stephen enroute so I never made it whilst the Class 56's were in charge of trains there. 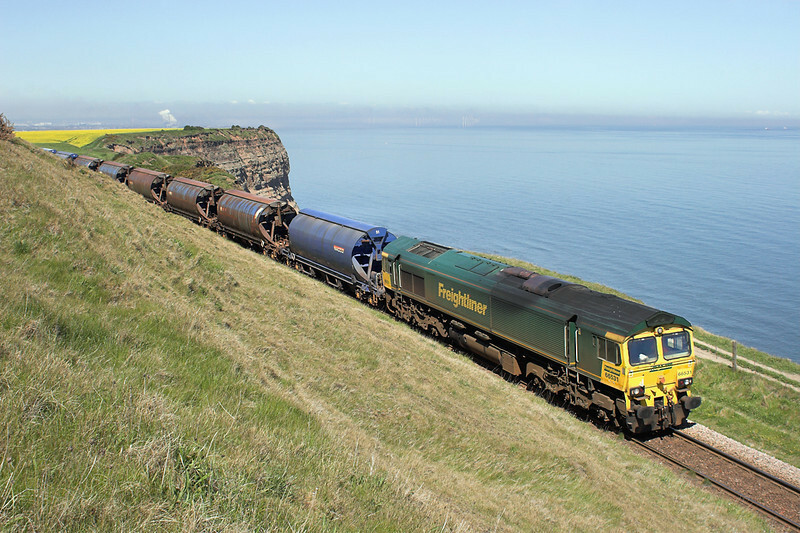 The line is highly scenic as it hugs the top of the North Sea cliffs; trains go to either the mine at Boulby or the steel works at Skinningrove. 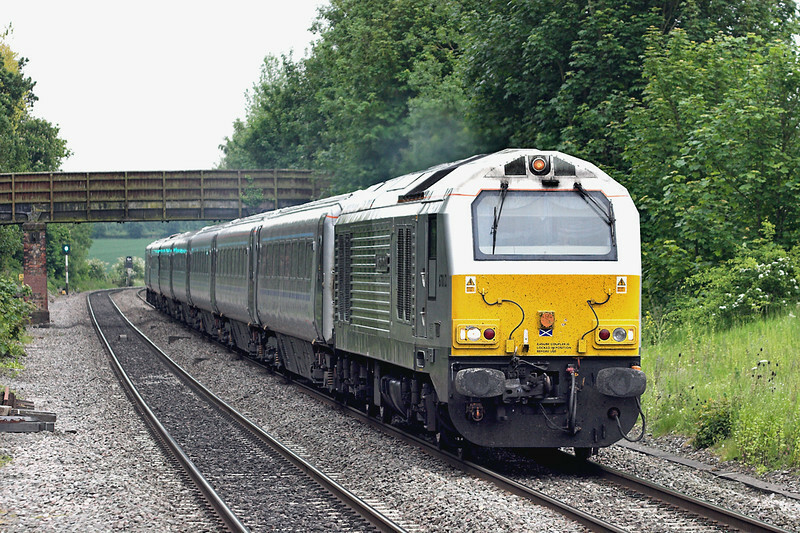 Trains to the latter were all cancelled on the day we visited so we had to make do with shots of the two Freightliner 66's working the Boulby to Middlesborough circuit. After a few hours sat on the cliffs watching the Haar (Sea Fog) advancing slowly along the coast across Redcar and Saltburn it eventually rolled over us just before the train above returned from the mine. Unsure whether to hang round or not we decided as we were there we should, and luckily the Haar cleared just enough by the time the next inward working passed the old mine pumping house at Hunt Cliff. You can see the bank of fog behind the train meaning my preferred higher angle picture to get the sea in the background was pointless. Less than 15 minutes later as we walked back along the cliff path to the car it had all cleared away and, for us, the rest of the day was fine. I believe we were lucky though with the weather. We finished the day on the East Coast Main Line just north of Northallerton and, whilst we had unbroken sunshine, we could see clouds building to the south. I have since spoken to someone who was near York and it was dull from mid-afternoon. 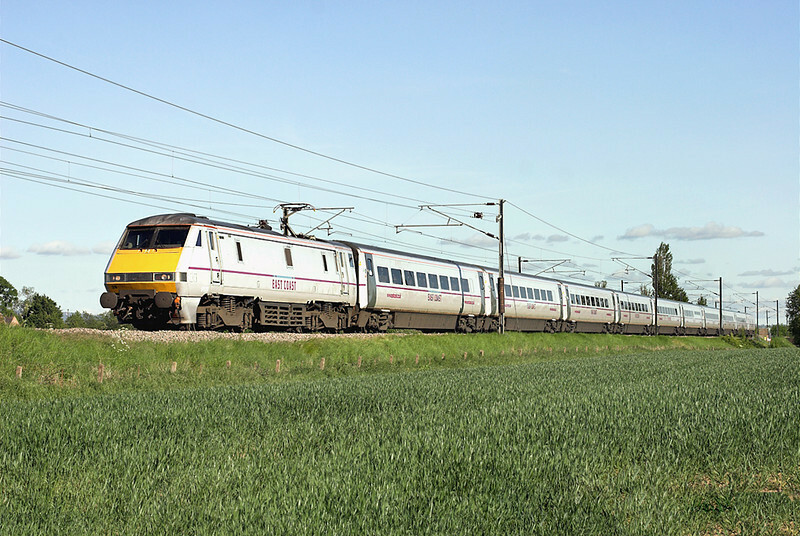 It's always a pleasure to photograph the ECML but to get the light right for the Class 91's which are usually on the northern end of trains is tricky except in Scotland where the line heads east to west. Two hours therefore on a June evening is just what you need; we left the location at 1930 as I had to get to work, but could have had at least another 90 minutes photographing at the nice open location we found near the village of Birkby. We just missed a southbound tank train hauled by a class 60 but there was more than enough passenger trains formed of HST's and 91's to keep us occupied. 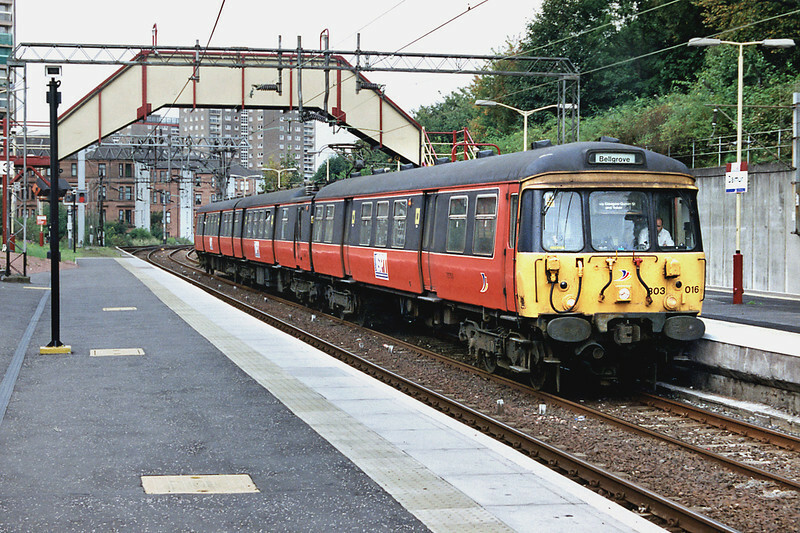 Tuesday was an good day, but one working on my home patch I missed going to the North-East was a DRS train that runs maybe once or twice a year. There are regular movements of low level nuclear waste from Workington Docks to the processing centre at Drigg but occasionally some domestic movement is also needed. 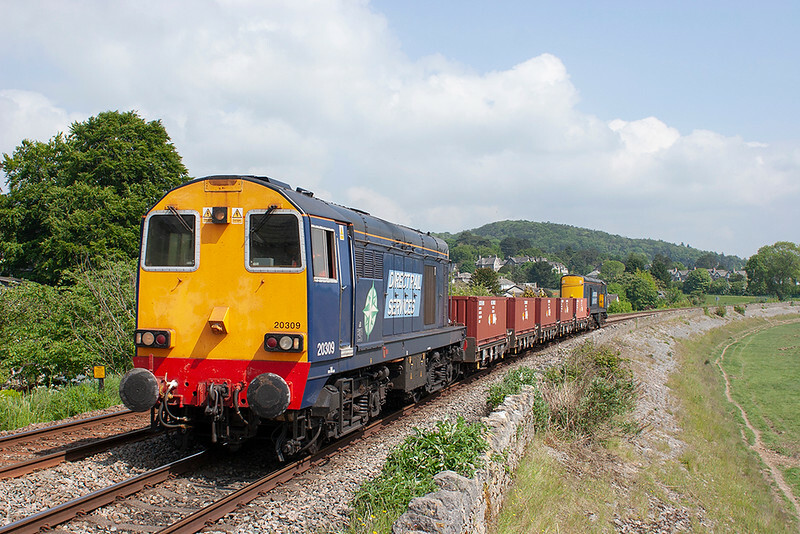 The wagons on this train are different from the usual ones used to transfer spent fuel from Power Stations so I had to make the effort to photograph the return working. 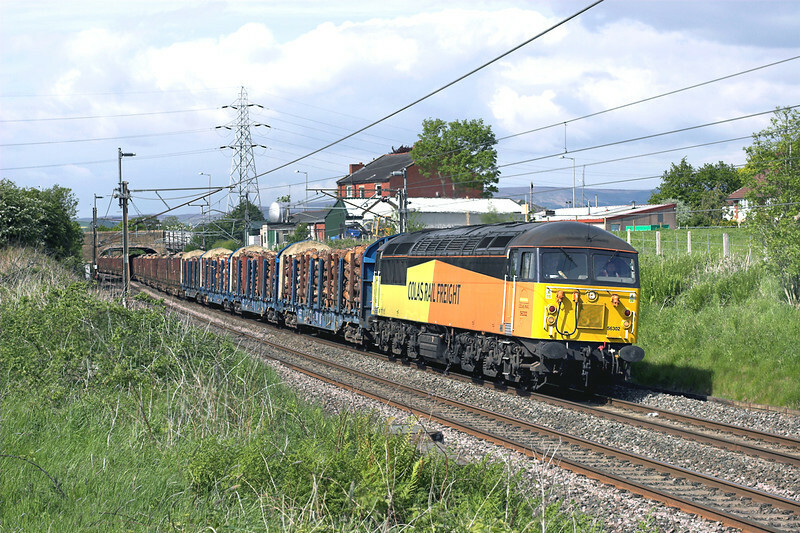 Apart from the Teeside jaunt I have used the nice weather to catch up on old local locations, and find the odd new one, for the handful of freight trains that pass through Lancashire each day. I have many pictures from the likes of Brock and Woodacre, in general I won't now bother to take pictures of Virgin's class 221/390 or TPE's 185 there, but the presence of the Colas 56's gives me reason to return. I have managed to find a couple of new vantage points; one of the ones that I have intended to do for ages is immediately north of Balshaw Lane Junction at Euxton on German Lane. You need to know for this shot that the train is going to run on the Fast Line as the Slow Lines are about 100 yards further west. The recent bank stabilising work is interesting in that when the North Union Railway first built the line in 1837 the embankment collapsed when the River Yarrow that flows through the valley flooded taking a good bit of the earthworks and railway with it. Another area I looked at was immediately south of Brock where an underbridge links with the footpath from the more well known and photographed crossing. It's not a location I'll return to too often as it is just a morning shot and also there a few trees in the way, but I felt it was worth a punt for a West Coast Railway empty stock working to Derby. 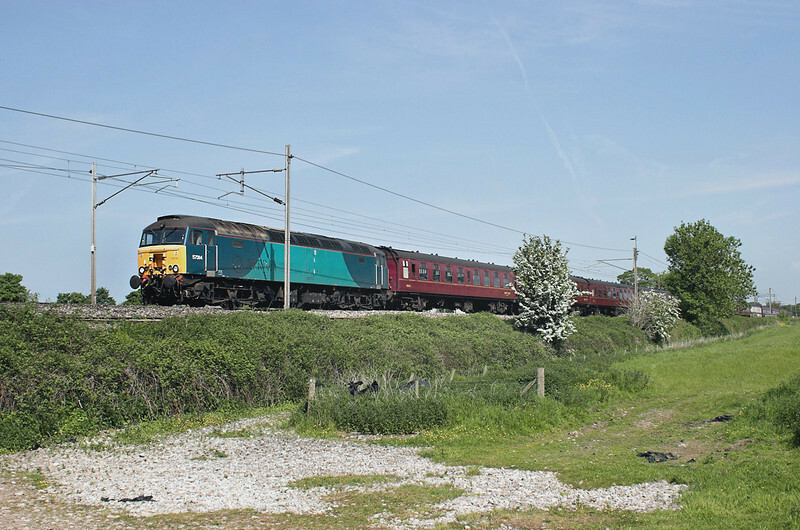 I had forgotten that they had recently bought a number of the ex-Virgin Class 57/3's; debranded Arriva liveried 313 was in charge whilst the stock of the Statesman that ran an hour later had 57315 and 57316 at either end. All my pictures from the week can be seen for the next month or so on my New Additions page and, thereafter, in the 2013 folder of Trips. Next week I am off work so will hopefully wander somewhere further afield, please keep an eye on this blog or indeed my website to see where I end up: unfortunately I suspect the weather won't be quite as good as it has been for the last 7 or 8 days! I'll leave you with a rare picture, not only rare because it is one I have taken of a steam train, but also because I didn't have to jostle for position with lots of other photographers despite the fact that the engine was steaming well and the sun was out. Thanks for reading, bye for now!